If you have been reading my blog for awhile, you know that I am obsessed with getting great deals. It is like a high for me to find clearance, use my coupons or find stock-up prices on my favorite items. Recently, I found low-sodium canned beans reduced for like $.29 a can so I literally got cases worth. We love our beans! My dad and I have had a tradition of going out Black Friday shopping for many, many years. When I was a kid, it especially meant a lot to me because it was something that just my dad and I did, not my siblings. I always cherished that one-on-one time with him (and still do!). We love getting deals and will call each other when we find great deals. Along with Black Friday, Cyber Monday is a big deal. You can find great deals online right from the comfort of your own home. I have been getting more into online shopping, especially for electronics, health and fitness items, kitchen equipment, etc. I recently got to check out CyberMonday.com and shop their great deals. I purchased some health and fitness and kitchen items from CyberMonday.com. I wanted to share with you some ideas that I have for some holiday gifts for the health nut in your life. 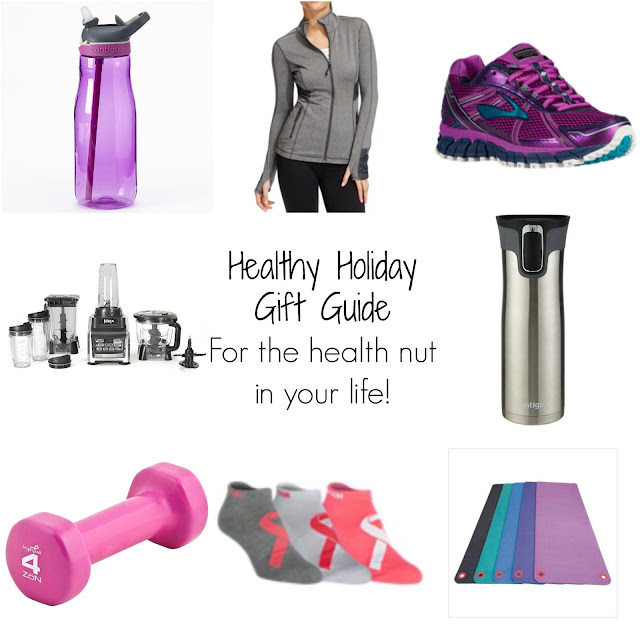 If you have someone if your life that loves living a healthy lifestyle, this is the gift guide for them! -Nutri Ninja- This blender/food processor is amazing and I have been using mine for years! -Contigo water bottles and travel mugs- the absolute best! I have been using them for years and keep buying more. -Running shoes- can't go wrong with a new pair of shoes. -Workout clothes- I love getting workout clothes for a gift since I wear them so often. -Socks- Sports socks are a great stocking stuffer! -Dumbells- I love hand weights because they make working out anywhere easy. All of the brands that I have mentioned, I have personally used and love. The other items are ones that I love to get for a gift! I had not used CyberMonday.com before but enjoyed checking it out. What it is is a place that compiles all of the sales for top retailers to save you money, time and energy. It is a one-stop shop for tons of Cyber Monday promotions. Just looking at it gets me so excited for holiday shopping. You can search for a product that you want such as the Contigo water bottles I love and they will pop right up. You just click through to that offer and it will take you right to the page to buy on another retailer's site. Luckily, it is not Cyber Monday specific and actually has great deals all year round. They also have coupon codes, limited time offers and more from over 800 stores! They have a Deal of the Hour that will change ever 60 minutes. These offers may include free shipping, $ off, % off and free gifts.